Yesterday, like much of July this year, was a very grey, gloomy day....so I cheered myself up by putting together some new filled party bags. There are princess party bags, happy zoo party bags, lots of different party bags for boys, a beautiful flower party bag, and the lovely summertime special party bags, like the one on the left. Woo hoo! Today we're celebrating our 5000th order since we moved website hosts in August 2007. Well, I say celebrating, but it's a day like any other - but it's always nice to reach a new milestone...I wonder when we'll reach 6000? 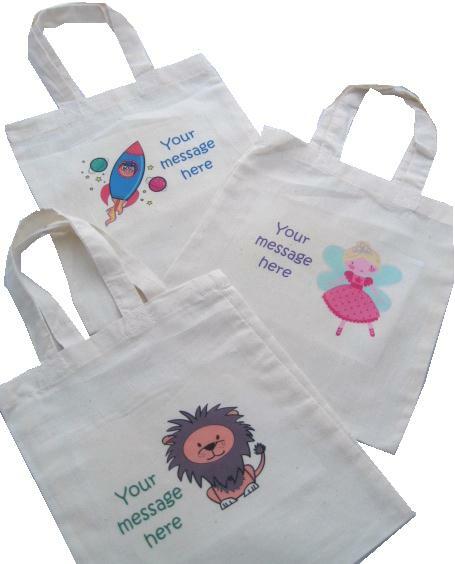 Most of today will be spent printing our best selling and much loved personalised cotton party bags. These are such a hit with customers because they are eco friendly, long lasting and of fantastic quality. Each one can be individually tailored to your requirements, with your choice of character, and either a name or a message of your choice. They're proving very popular at the moment for use as wedding activity bags for children.